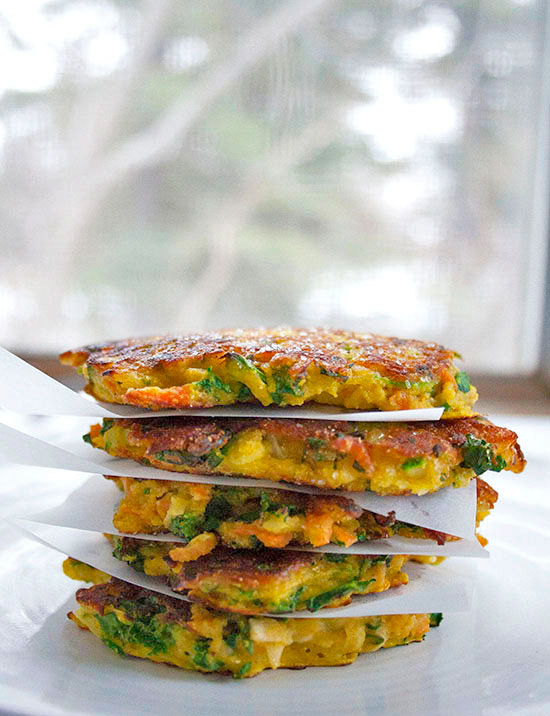 A great snack, app or savory weekend pancake alternative. 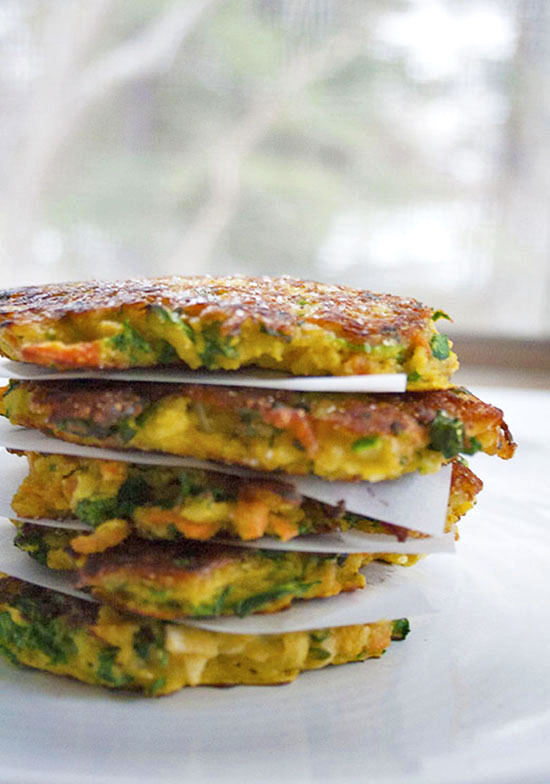 These veggie pancakes are a quick, healthy snack packed with grated root veggies and curry. Mini-mountains of gray snow currently line the streets. It’s cold, wet and overall gross out. Weather like this makes me want to curl up under lots of blankets. Who am I kidding, I’m under 2 layers of blankets right now! 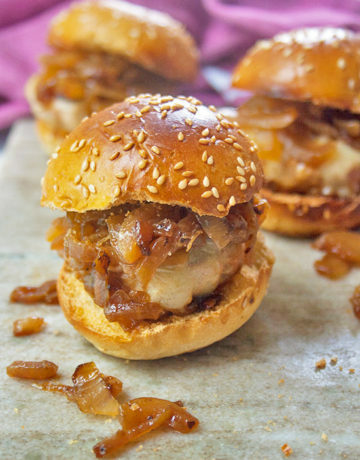 The cold also amps up my cravings for warm, hearty snacks. My body seems to be preparing for hibernation and it feels like my stomach is screaming “Feed me Seymour”. 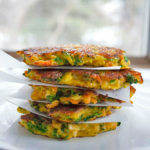 To combat the urge for heavy, not-so-good-for-you snacks, I packed these veggie pancakes with filling root veggies and warm spices. When you’re eating hot snacks, I think it’s necessary to have some sort of dip. Why you ask? I’m lactose intolerant, so I use nature’s mayo (avocado) for making most of my dips and spreads, but you can use regular mayo, sour cream or Greek yogurt instead. For this dip, I put 1 Haas avocado in the food processor with 2 tbs of sun dried tomatoes. Add a pinch of salt and blitz it up with until it’s nice and smooth. 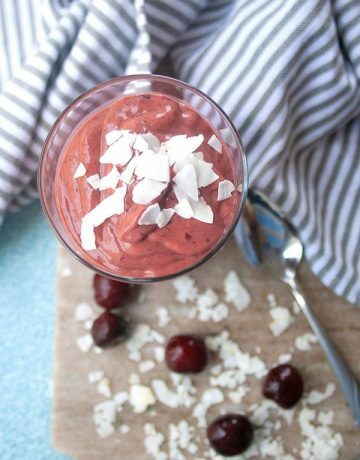 Voila, multipurpose dip that you can smear on everything. In a large bowl stir together vegetables, egg and milk until combined. In another bowl mix together spices, flour, cornmeal, baking powder and salt and pepper. 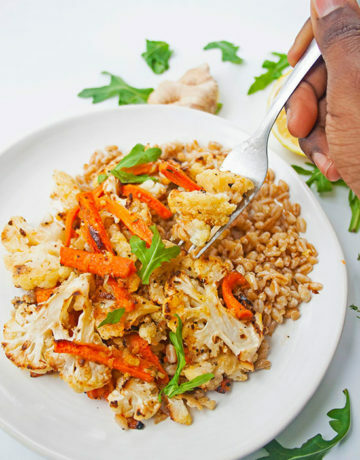 Gradually fold the flour mixture into the veggies until thoroughly combined (no lumps). Heat a skillet to medium-high heat. Drizzle in olive oil. Use a ¼ measuring cup and pour about four pancakes into the pan. Cook for 2-3 minutes per side until golden brown. The full recipe makes about 8 pancakes. Place pancakes on a paper towel lined baking sheet. Sprinkle hot pancakes with salt and enjoy. If you like your pancakes thinner, add an extra splash of milk.